★【MOTHERS DAY GIFTS ! !】 It came in a pretty box and already wrapped for you. 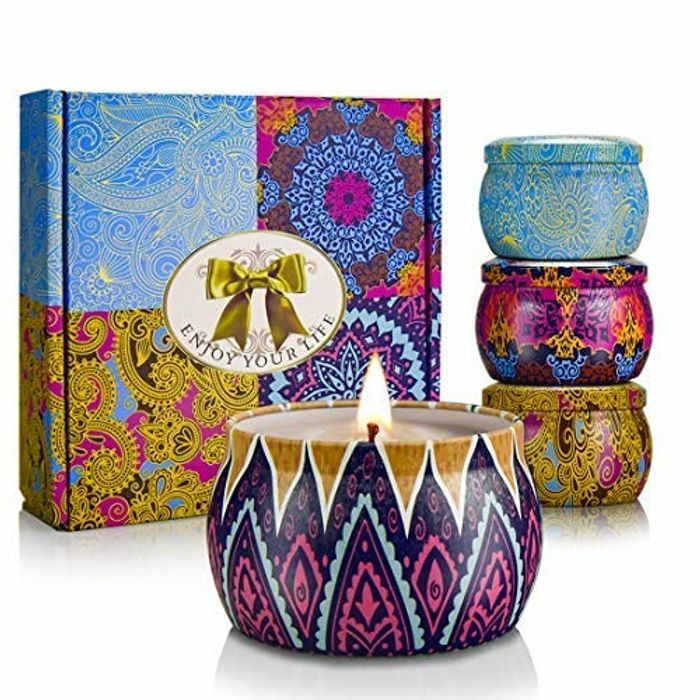 The box contains 4 different scented candles in different coloured jars looks very noble. ★【LONG BURNING TIME】5.5 OZ/Each candle and burn hour: 25-30 hours. Once empty you can use it again for candles or as a jewelry box. ★【100% SATISFACTION GUARANTEE】If you are not satisfied with our Scented Candles when you open the package, please contact us immediately. We PROMISE offering you a satisfactory solution. Beautiful candles but there not normally over £31!!! More around £15 - £20. I just copied what it said on Amazon. TractorGirl327 thank you for posting I purchased two yesterday and they came today and they're incredible! Lovely candles, thanks for posting.